Recipe cards are becoming a thing of the past. We now look online for a recipe rather than in a cookbook or in a recipe file. I love looking at vintage recipe cards for meal ideas and particularly enjoy the card if the handwriting is a relative’s. At Christmas my friend, Richella, from Imparting Grace made a Christmas ornament using a copy of one of her mom’s handwritten recipes. I loved this idea and today’s project was inspired by Richella’s ornament. Rather than make a Christmas ornament using family recipe cards, I created mini kitchen art. All of the projects that I’m sharing today will be gifts for my mom, aunts, and cousins. I hope that they love this project as much as I do! 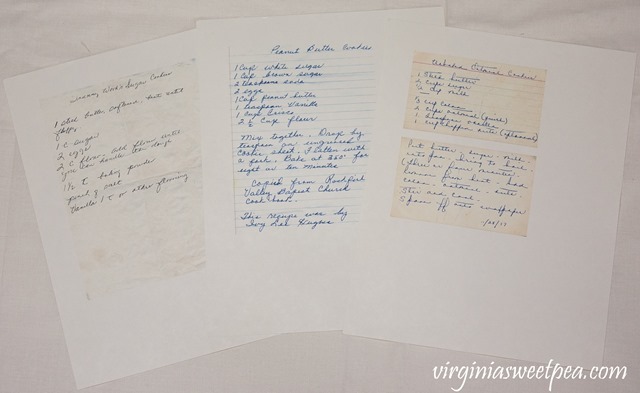 For this project I looked through my mom’s recipes to find a few in my grandmother’s handwriting. I was thrilled to find Granny Wood’s Sugar Cookies because that was a treat that Granny made for us from time to time when we visited on Sunday afternoons. I also wanted a recipe in Granny’s sister Frances’ handwriting so that I could make a gift for her granddaughter, Katie. I found a recipe card for Unbaked Oatmeal Cookies that Frances dated 11/28/77. I then scanned the recipes into my computer and printed them on cardstock. 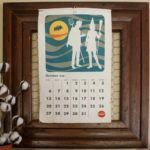 I had several DIY Weathered Wood Craft Boards from Oriental Trading on hand that I used for this project. I used one of these boards for the DIY Button Heart that a shared a few weeks ago. 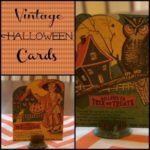 After examining the craft boards, I noticed that the paint job on several of them was poor, so I covered the boards with paint flaws with scrapbook paper using Mod Podge. 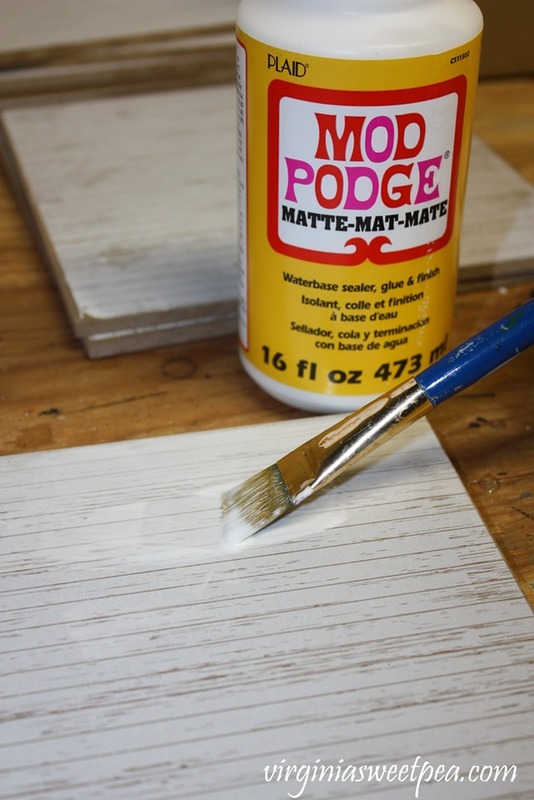 To cover the boards with scrapbook paper, first cut the paper to the size of the board, then brush the board with a thin coat of Mod Podge, then apply the scrapbook paper. 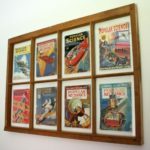 For this project I also used Unfinished Wood Rectangular Plaques from Oriental Trading. 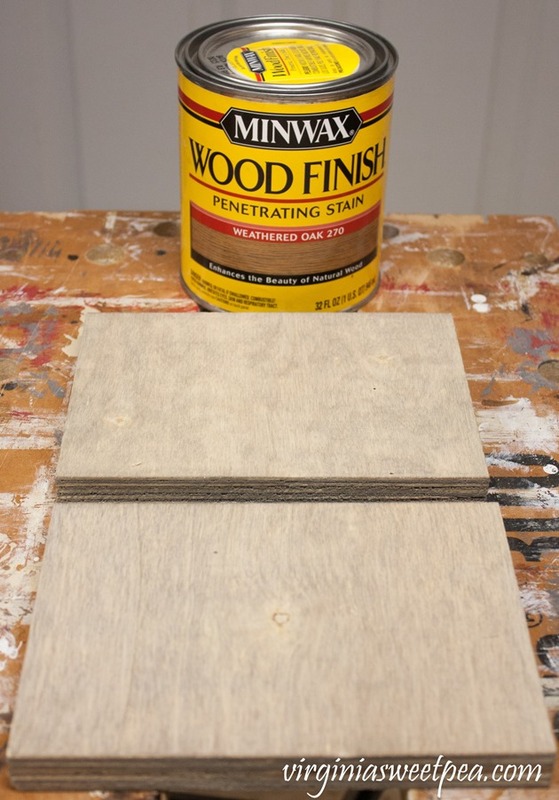 I stained the wood with Minwax Wood Finish in Weathered Oak. 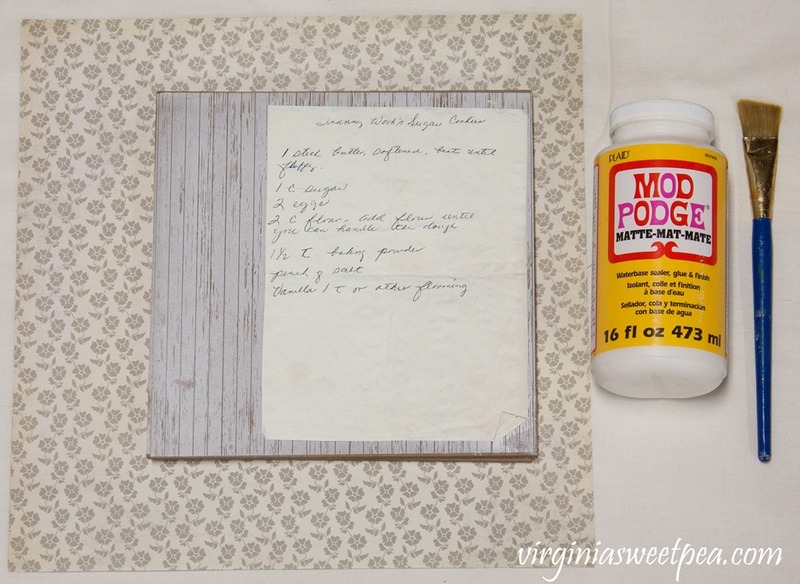 After the craft boards were prepared, I cut out the recipes and used Mod Podge to glue them to the boards. When the boards were dry, I added a topcoat of Mod Podge as a sealer. 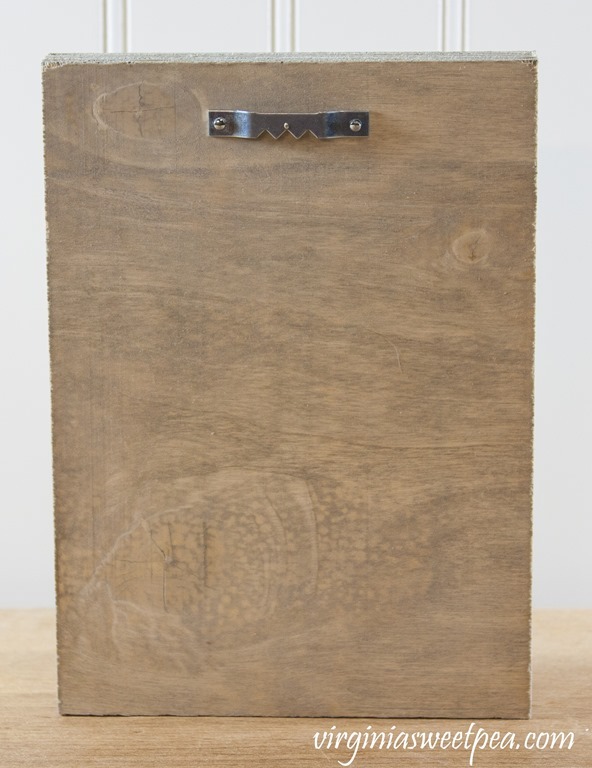 Attach a hanger to the back of each craft board. I had to glue the hangers to the craft boards but was able to easily nail the hangers into the wood plaques. 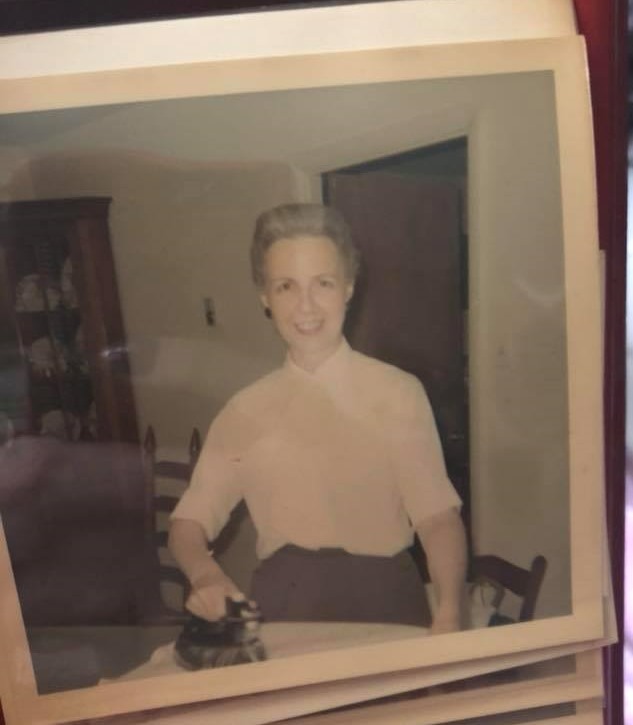 When I share vintage things that I inherited from my grandmother, I’m almost always referring to my paternal grandmother. I have many of her handwritten recipe cards but did not use any of them for this project. 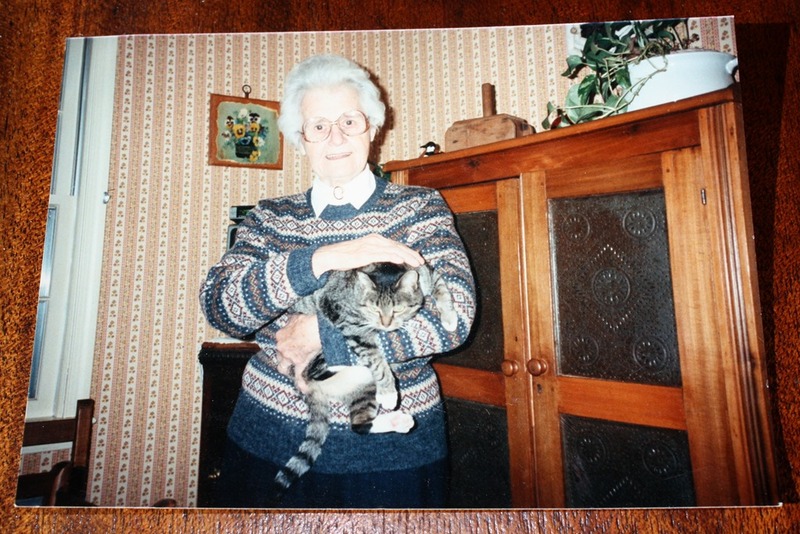 Granny Wood is my maternal grandmother. Most of her grandchildren called her Granny Wood to differentiate between their maternal and paternal grandmothers. Some of my childhood friends who knew Granny from church and who used to visit her with me even called her Granny Wood. Granny Wood was a good country cook who made biscuits three times a day and even baked them in a wood burning cook stove in the winter. My cousin now lives in her house and still uses the same wood burning cook stove her kitchen. Here is my sweet Granny Wood in the 1980’s holding my cat, Miss Prissy. Granny Wood’s sugar cookies were so good. 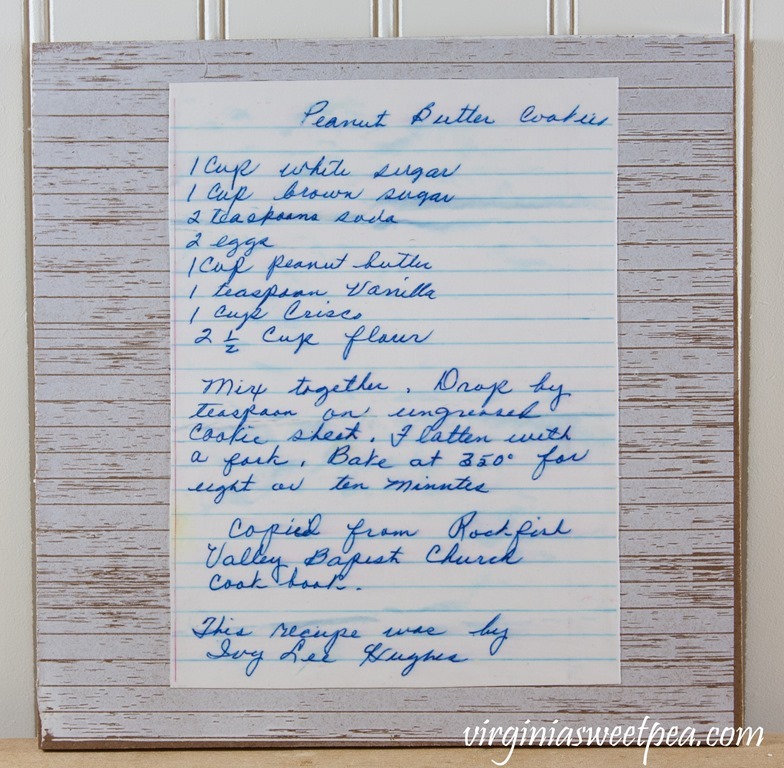 I hope that her recipe made into kitchen art will be a gift that my aunts and mom will enjoy receiving. I don’t remember Granny Wood making Peanut Butter Cookies but she probably did so when I was not around. I would recognize Granny’s handwriting anywhere. Granny’s sister Frances was also a very good cook. She made the best pecan pie and never shared that recipe with anyone. I hope that her granddaughter, Katie, has it so that that recipe isn’t gone forever. Frances also made the best brownies. I will send this kitchen art to Katie and I hope that she loves displaying it in her kitchen. Katie recently posted this picture of Frances on Facebook. I also made a gift to send to my sister-in-law. My mother-in-law had beautiful handwriting. When I asked my father-in-law for one of her recipes to use for this project, we couldn’t find many. I’m hoping that my sister-in-law has them as I know at one time she had a card file full of them. 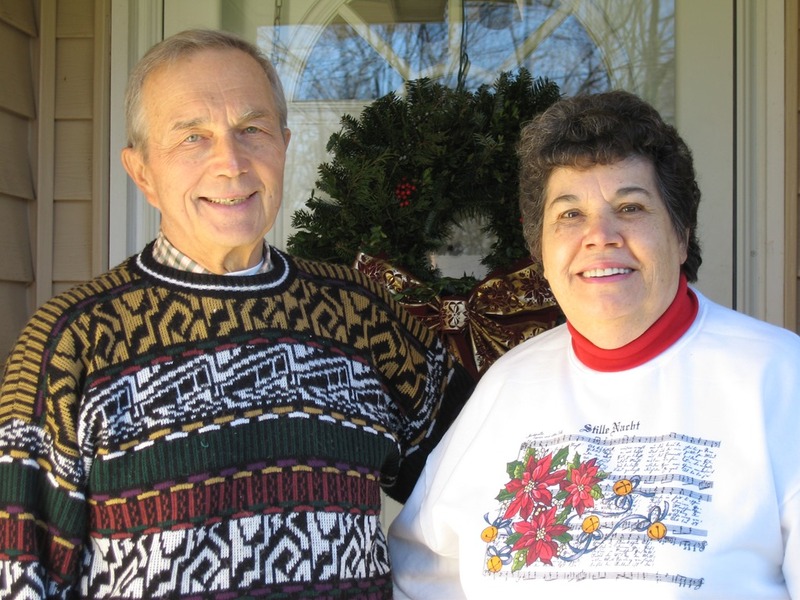 Ruth was an avid reader and enjoyed mysteries by Diane Mott Davidson. Ruth copied this recipe from Killer Pancake. Here are my in-laws, Rich and Ruth. We all miss Ruth so much. 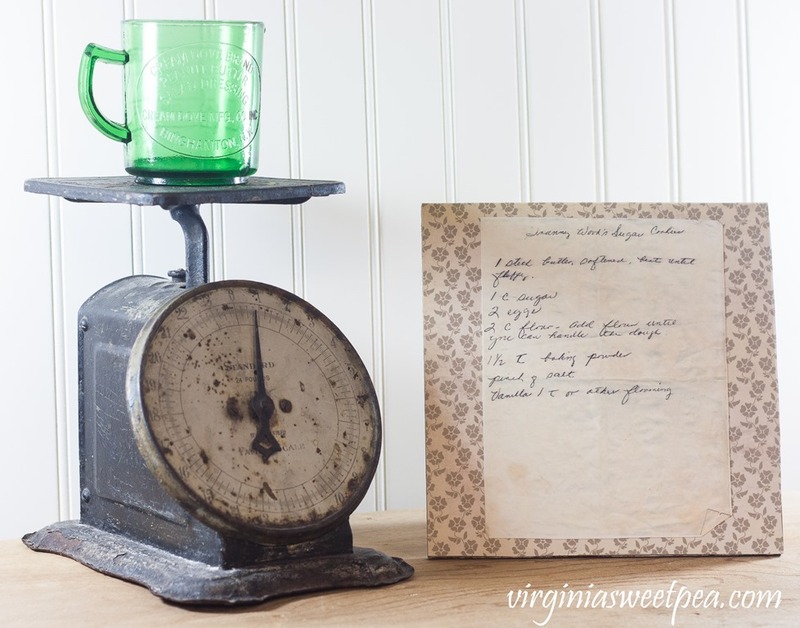 It was fun to create kitchen art using vintage recipes to give as gifts to my family. 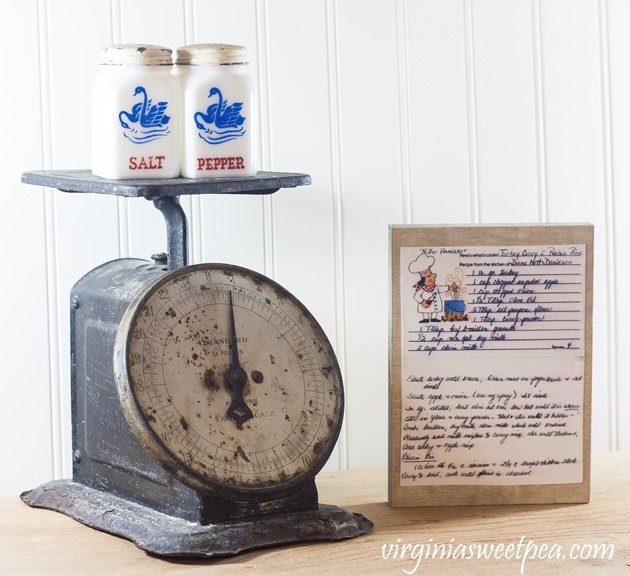 If you have some vintage recipe cards that you’d like to display, consider this easy craft. In October that would be a great remember her cooking receipts. Have a great Valentines Days! 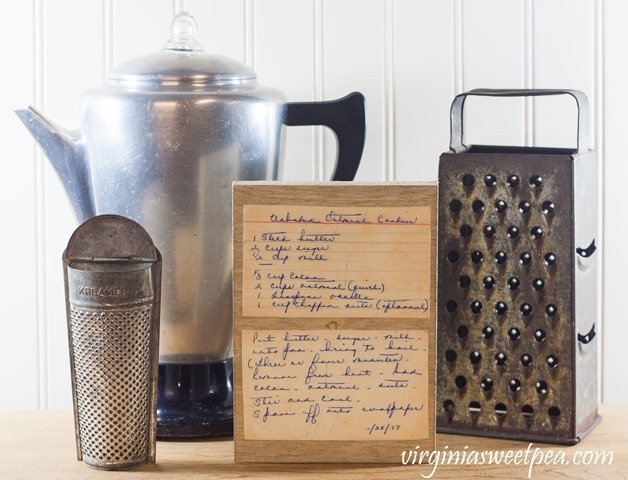 I love these ideas for recipe cards. I have some of my mother’s and hesitated to do something permanent to them. I had not thought of copying them onto card stock; thanks! One idea I might do is the card stock thing, glue onto something a placemat size and laminate. What do you think? Great idea! Handwriting recipes is now a lost art. Maybe it’ll come back as a “trend” in the future! This is a wonderful idea. What a great gift and a special rememberance. What a creative way to preserve precious memories of old times and delicious recipes! Thank you, Kristin! I am so happy with this craft! Paula – This post made me SO nostalgic. What a beautiful way to display and remember your Granny Wood. This is definitely a project I will be doing in the future. Thanks for sharing! Thank you, Christy! My Granny Wood was a special lady. We’ll have to exchange grandmother stories sometimes. I love this, Paula! What a great way to use the recipe cards. I’m delighted that my little ornament inspired you, and you’re so kind to link to my post. 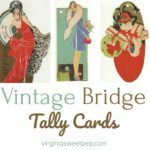 One of the things I like best about blogging is that we can all share ideas and spur one another on to do such fun things. I’m honored that you’d take my little idea and apply your incredible DIY skills to it! You rock! I loved your idea and your projects. I still prefer printed recipes and print off the ones I find on-line. It would be a great way to pass on family recipes! One on my favorite all time bridal lshower gifts was a recipe box filled with hand written recipes by 2 college classmates. Forty-five years later, I am still using and loving a lot of those recipes! Laminating a placemat of them would prevent the grease stains that my old cards have, too! Thank you! I also print out recipes and prefer to use those over looking at a tablet or phone while I’m cooking. I’d probably enjoy looking through your recipe box and I’d need a stack of recipe cards to copy recipes while I browsed. What a wonderful idea! 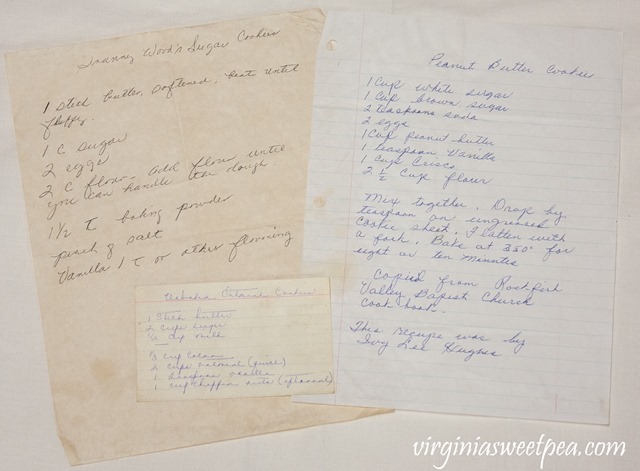 I have a lot of vintage recipes from my grandmother. 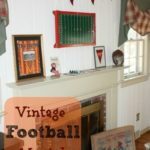 I will use your idea to make such beautiful vintage decor. Thank you! Thank you, Simona! It’s a great way to enjoy the recipe without damaging the original. Paula, this is such a great idea! 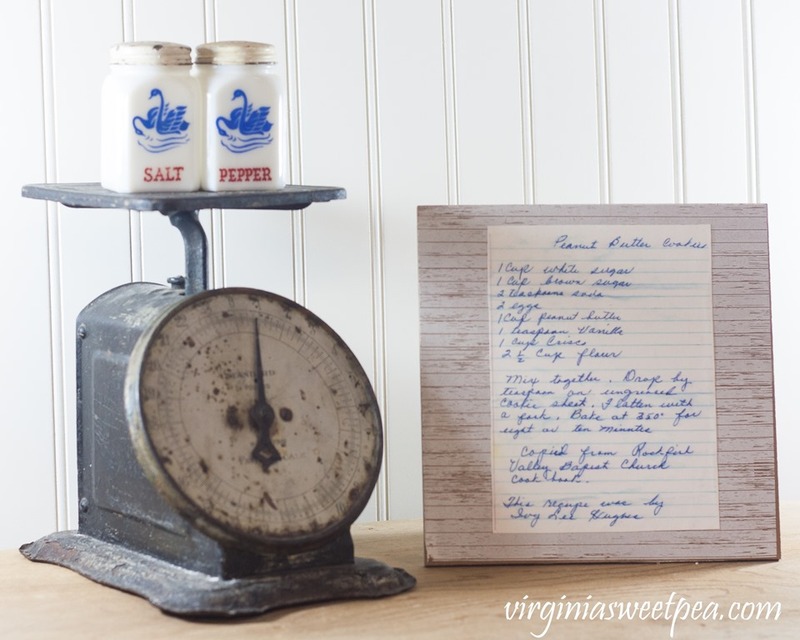 Hand written recipe cards are disappearing and you have created such lovely way to preserve a family’s history! Thanks for sharing this idea with us! 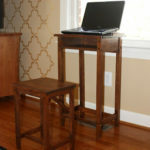 I found you on the Home Style Gathering Link Up that Julie is sharing on her blog My Wee Abode! I just pinned it too! Thank you so much for commenting, Cindy! Recipe cards are disappearing as well and cookbooks don’t seem at all popular with the younger generation. 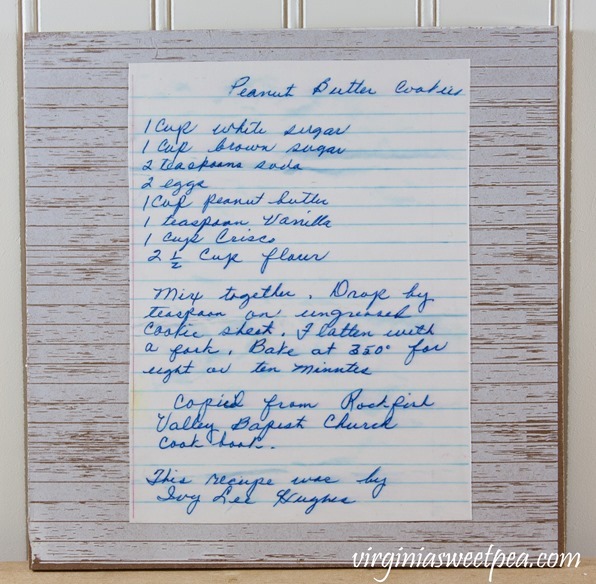 I love pulling a recipe card out of my box that is written in my mom or grandmother’s handwriting. These are so awesome! What wonderful gifts and a great way to share memories! I love them! Thanks so much for linking up at Celebrate Your Story! Hugs! Thank you, Benita! I enjoyed making them. This would be a wonderful way to share your sister’s recipes with friends and family who loved her. Such a great idea in so many ways. Love the vintage look for a kitchen, and the lovely nostalgia that it brings. Also, love that this shows a love and respect for our relatives, whether parents, grandparents or others! Thanks so much for sharing on Homestyle Gathering, Paula! 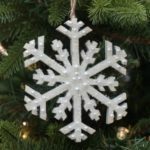 Thank you so much for sharing this idea…My daughters and nieces have such great memories of their “Hanni” and decorating her Christmas cookies every year was one of them! 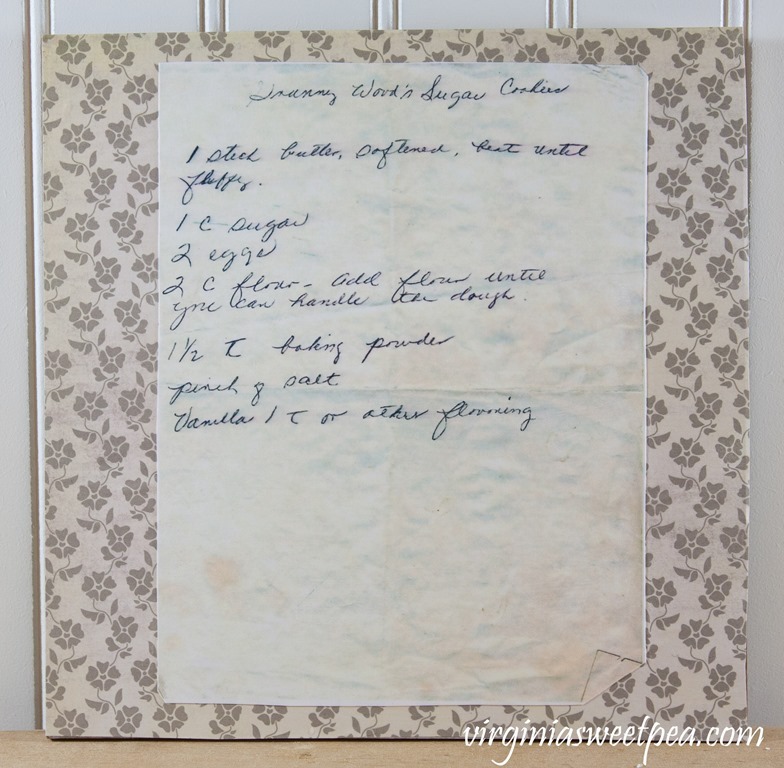 And….I have that recipe in her handwriting and I can’t wait to do this for each of them! Love, love this idea which will make them smile every time they look at it….gettin’ a little teary-eyed here….